For investors, the emotional pendulum swings back and forth between fear and greed. 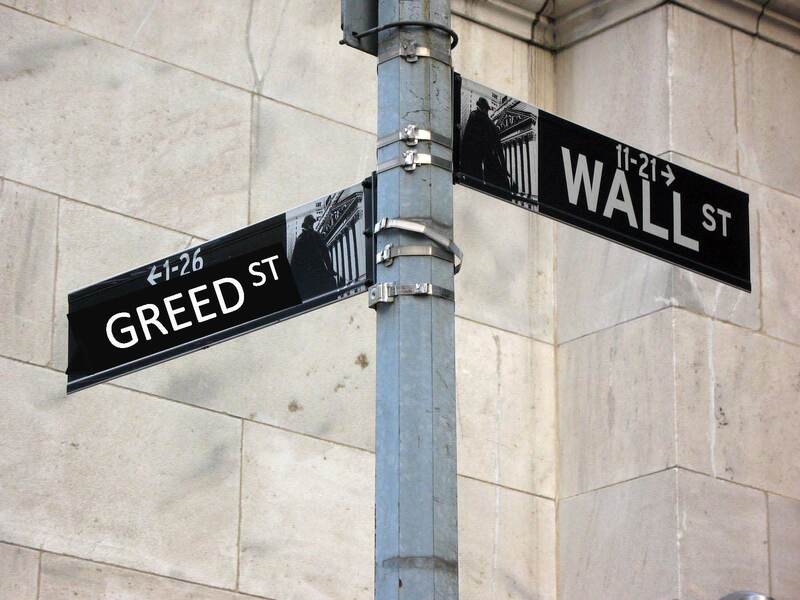 Wall Street and large financial institutions, however, are driven by one single mode…and that is greed. This is nothing new and has been going on for generations. Over the last few decades, cheap money, loose regulation, and a relatively healthy economy have given Wall Street and financial institutions free rein to take advantage of the system. The disgusting amount of inequitable excess is smeared across the whole industry in this tiny, partial list. 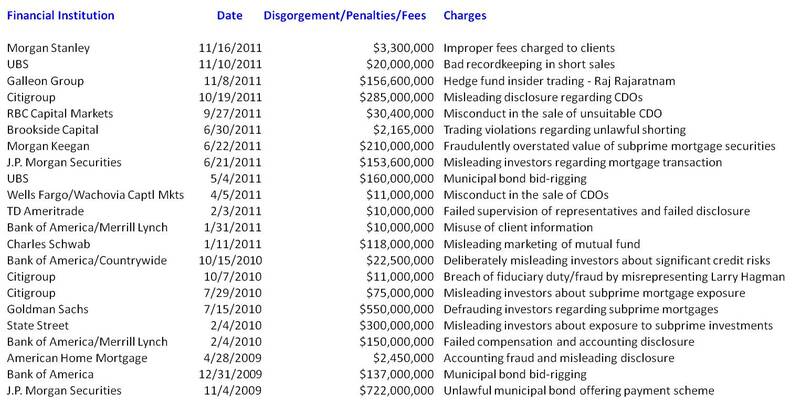 Billions of dollars in penalties and disgorged assets isn’t insignificant, but besides Bernie Madoff and Raj Rajaratnam, very little time has been scheduled behind bars for the perpetrators. Are the greedy bankers and financial institution operators the only ones to blame? Without doubt, lack of government enforcement and adequate regulation, coupled with a complacent, debt-loving public, contributed to the creation of this financial crisis monster. When the economy was rolling along, there was no problem in turning a blind-eye to subversive activity. Now, the greed cannot be ignored. Besides boycotting greedy institutions and using the voting booth, what else should individuals do with their investments in this structurally flawed system? First of all, find independent firms with a fiduciary duty to act in your best interest, like an RIA firm (Registered Investment Advisor). 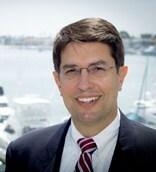 Brokers, financial consultants, financial advisors, or whatever euphemism-of-the-day is being used for an investment product pusher, may not be evil, but their incentives typically are not aligned to protect and grow your financial future (see Fees, Exploitation, and Confusion and Letter Shell Game). There is a lot of blame to be spread around for the financial crisis, and the intersection of Wall Street and Greed Street is a major contributing factor. However, investors and voters need to wake up to the brutal realities of our structurally flawed system and take matters into their own hands. Only then can Main Street and Wall Street peacefully coexist. DISCLOSURE: Sidoxia Capital Management (SCM) and some of its clients own certain exchange traded funds, but at the time of publishing SCM had no direct position in MS, UBS, C, JPM, WFC, SCHW, AMTD, BAC, GS, STT, Galleon, RBC, Subway, Amer Home, Brookside Captl, Morgan Keegan, or any other security referenced in this article. No information accessed through the Investing Caffeine (IC) website constitutes investment, financial, legal, tax or other advice nor is to be relied on in making an investment or other decision. Please read disclosure language on IC “Contact” page. Entry filed under: Banking, Financial Markets. Tags: banks, Bernie Madoff, disgorgement, financial regulation, fines, insider trading, Occupy Wall Street, Raj Rajaratnam, RIA, SEC, Wall Street. New addition: Wells Fargo pays $148m to settle bond case. Barclays said it would pay $453.6 million to settle U.S. and U.K. charges it manipulated Libor, the interbank lending rate underpinning $360 trillion in loans and financial contracts. Another 20 banks being investigated for potential involvement. Libor rate rigging could cost UBS $1 billion (Reuters 12/16/12)http://www.reuters.com/article/2012/12/17/us-ubs-libor-idUSBRE8BG00620121217 UPDATE: UBS settles for $1.5 billion!